On the 27th (Sat), see the sights as you ascend with a climbing tour, admire the natural beauty at Rose Gardens, and then take in nature's colorful creations at Tea Gardens. To find more things to do, reviews, and more tourist information, read Munnar online trip planner . Kochi (Cochin) to Munnar is an approximately 2.5-hour car ride. In April, daytime highs in Munnar are 40°C, while nighttime lows are 29°C. Wrap up your sightseeing by early afternoon on the 28th (Sun) to allow time for travel to Munnar. Kick off your visit on the 28th (Sun): admire the natural beauty at Green Field Spices and Herbal Garden and then see human ingenuity at work at Mattupetty Dam. To find traveler tips, other places to visit, and tourist information, read Munnar trip maker app . Finish up your sightseeing early on the 29th (Mon) so you can go by car to Thekkady. 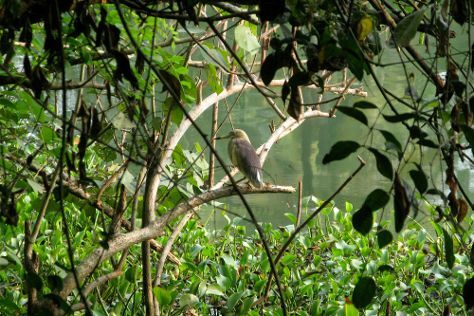 Kick off your visit on the 30th (Tue): explore the activities along Periyar Lake and then look for all kinds of wild species at Periyar Tiger Reserve. For ratings, photos, reviews, and tourist information, read our Thekkady day trip planning site . Traveling by car from Munnar to Thekkady takes 2 hours. Finish up your sightseeing early on the 30th (Tue) so you can travel to Kumarakom. Kumarakom features one of Kerala's most scenic lakes as the backdrop and serves as a gateway to the area's famous backwaters. Start off your visit on the 1st (Wed): examine the collection at Bay Island Driftwood Museum and then look for all kinds of wild species at Kumarakom Bird Sanctuary. To find traveler tips, maps, where to stay, and tourist information, read Kumarakom online itinerary planner . You can drive from Thekkady to Kumarakom in 4 hours. In April, plan for daily highs up to 39°C, and evening lows to 30°C. Finish up your sightseeing early on the 1st (Wed) so you can travel to Kovalam. Start off your visit on the 2nd (Thu): kick back and relax at Lighthouse Beach, stroll through Kovalam Beach, then admire the striking features of Sree Padmanabhaswamy Temple, and finally don't miss a visit to Pazhavangadi Ganapathy Temple. To find where to stay, reviews, more things to do, and tourist information, you can read our Kovalam driving holiday planning site . Traveling by car from Kumarakom to Kovalam takes 4.5 hours. In May in Kovalam, expect temperatures between 37°C during the day and 30°C at night. On the 3rd (Fri), wrap the sightseeing up by early afternoon so you can travel back home.